A fun little gift, a perfect rainy day activity and boredom killer, constructed from wood these products are ideal to keep this on your desk at work or at home; for the times you need a break, inspiration or a few minutes to yourself, relax with a vintage styled puzzle. - 5 BOREDOM BUSTER GAMES IN 1: The games are presented in a beautiful wooden box with a slide top lid. One side of the lid features a a ludo board whilst the other side is a chess board. In this set you will receive Chess, Ludo, Mikado, Draughts and Dominoes, all the classics! - COMPACT AND HANDY: The box measures 16.7 x 16.7 x 3 cm making this ideal for use on the go. Travel sized you can take this on day trips, road trips, holidays, weekends away and more. This is a fantastic item for when you have family or friends round, spend some quality time together with some glassic games you can enjoy time and time again. 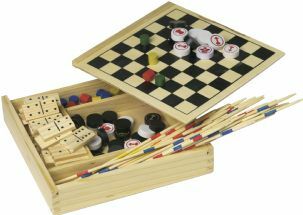 - THE SPECIFICS: In this box you will receive 41 mikado sticks, 28 domino pieces, 4 yellow / 4 green / 4 blue / 4 red ludo pieces with a cute little dice, 16 white / 16 black chess and draughts pieces (the draughts and chess are the same pieces, chess on one side of the disc draughts on the other). We are certain you will LOVE this set of traditional games.